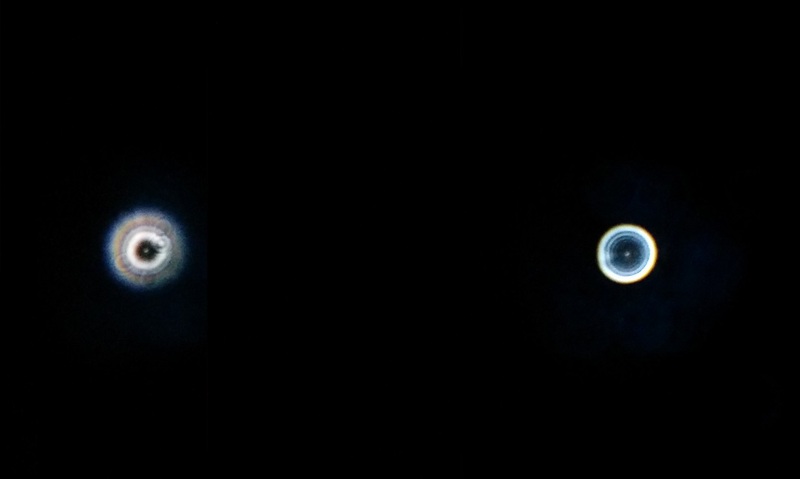 I know it's been documented in various places that an SCT (for the sake of this discussion, with primary mirror focusing) exhibits over correction when focused on close objects. I've performed my own experiments and found this to be true. However, my f/15 Mak has the opposite effect. The Mak exhibits under correction when focused close. telescope-optics delves into the math of SCT close focusing, but doesn't have a section on Maks. Why does the Mak have an opposite effect? Is it due to the steep light cone only passing through the weaker center of the meniscus? While a Schmidt corrector doesn't have this deep profile and isn't effected? I’m guessing you must be using a fairly small mak ? The amount of spherical aberration produced by mirrors does vary as a function of the distance of the target - for a spherical mirror for example it is precisely zero when the target is at the centre of curvature. So for an object closer than infinity then yes, a mak with spherical primary will appear overcorrected, and it gets worse the closer the target. This is easily seen with a maksutov newtonian aimed at an artificial star. Not sure why an sct would appear undercorrected. Edited by luxo II, 20 March 2019 - 04:31 PM. I probably wasn't clear in my original post. But when I focused on a close object, the SCT showed further over-correction. telescope-optics webpage and Suiters book suggest this to be true. This guy also did an experiment with his SCT and saw over-correction on close objects. However, when I focused the Mak on a close object, I saw the opposite effect. It showed further under-correction. Edited by Boom, 20 March 2019 - 05:37 PM. I have a MCT (with a proper size primary) and notice over correction when focusing on a nearby point source. The first question might be to ensure you are evaluating intra and extra focal images correctly. If so, then any under correction you see may have to do with vignetting the divergent wavefront from the meniscus and possibly an undersize primary mirror. Vignetting could clip enough of the wavefront on the margin to leave the remaining medial and paraxial zones under corrected. I'd have to think that through some more, but the resulting wavefront from the meniscus and the primary may not behave in the same way as a wavefront from a spherical or primary mirror alone. An SCT, with a high order term on the corrector, will test more or less like classic LSA. A MCT probably won't. That may be the difference you see. Edited by Asbytec, 20 March 2019 - 07:17 PM. That is very interesting. I just took a couple quick snaps of what I see in the MCT using my phone. Left is 8mm extra, right is 8mm intra. Object distance about 40 feet. I even looked at it through a 200lpi ronchi, and the curves bent in further than a swimsuit models waist. It's clouded over right now so I couldn't take a set focused at infinity, but I can assure you there is minimal SA in that configuration. In case you're wondering, it's an US made ETX125 with a proper oversized primary. Edited by Boom, 20 March 2019 - 08:54 PM. As you probably know, there is a ton of SA in the system, but it's likely very well corrected. The meniscus throws out a lot of secondary SA, and the primary is highly under corrected. But the combined wavefront can be very well corrected. I suspect what you're seeing is related to the MCT complex wavefront and unavoidable residual higher order SA as opppsed to classic LSA. I just don't know how. Interesting to figure it out. I don't know what the focal length of the (weak) meniscus is, but if you're point source is at or near it maybe that makes a difference. I believe the focal length of a negative lens is found by ray tracing the weakly diverging rays back to a point in front of the lens. Just wagging a guess, that may be 40 feet or so. Edited by Asbytec, 20 March 2019 - 10:36 PM. You can perhaps clean this up a bit. Get on Polaris and lock the mount. Now get your best in focus image and take note if there are any diffraction rings say at 100x. Hopefully none so start increasing magnification slowly until you can see one (hopefully) diffraction ring. Take note of how bright the ring is. If very bright then you can slowly, carefully move the primary in or out and hopefully dim the diffraction ring or maybe it will vanish depending on the magnification. The goal is to have the primary in the correct "infinite" position and this can be done like this and it is a tedious operation but the effort and outcome has always rewarded me here so this is a natural procedure for any Mak I may have. Use the best narrow field eyepiece you have and keep Polaris centered at all times. I'm OCD with my Maks and collimation and you can get them to perform at their very best. If you do this know that when moving the primary you only want to do minute (very small) movements and keep your eye in the eyepiece for instant feedback. This also helps with the initial movement and you can quickly tell if you need to take the primary in or out. TBH what’s the point of all this ? It has been long known that the SA correction of lenses is to some extent dependent on the subject/object distances, hence this should be no surprise. For much the same reasons as 1:1 repro or photocopier lenses are not great for landscape photography, and vice versa. Edited by luxo II, 20 March 2019 - 11:59 PM. What's the point of this forum? We should all be out stargazing. It's purely to satisfy a personal optics theory question. Namely, why an SCT and MCT (in my case) doesn't exhibit the same over correcting behavior when focusing on closer objects. Perhaps a move to the optics section of the forums is appropriate. If any mods are watching, feel free. Edited by Boom, 21 March 2019 - 12:02 AM. New to you perhaps but this is evident in the maths for 3rd order aberration theory, as far back as the 19th century. If anything it’s remarkable that a mak/SCT with just 4 surfaces works as well as it does. Edited by luxo II, 21 March 2019 - 12:05 AM. Care to share your knowledge on the subject since it isn't new to you? In your first response you said a Mak exhibits over-correction on close focus. Well, I posted an image of what I saw and it looks like under-correction. If that is over-correction then please explain why it looks like under correction. Edited by Boom, 21 March 2019 - 12:16 AM. I'm sorry I wasn't clear with my question in my original post, but I don't think you read my posts carefully either. I'm not surprised SA correction changes with the subject distance, I even said I've read some material regarding the subject. My point is, according to these texts, an SCT exhibits over correction when focusing close, and I was able to replicate this phenomenon on my SCT. But when I tried it with my MCT, I saw the opposite effect. I saw under correction. I was not able to find any text (online at least) explaining the theory of MCT close focusing. This leads me to my question of why my MCT, which in my mind should be similar to an SCT in that they are both spherical mirror Casses with a corrector, would show under-correction instead of over-correction when focused on a close object. Edited by Boom, 21 March 2019 - 12:38 AM. Sorry... different because the maks have concentric spherical surfaces apart from minor retouching on the primary. SCT's do not - primary and secondary aren't close to spherical. Edited by luxo II, 21 March 2019 - 12:41 AM. OK that is definitely news to me. Care to elaborate? Just to be clear, we are talking about "regular" SCTs for the purpose of this thread. No Edge HD, ACF, RCX, etc etc. Even Celestron says their regular SCTs have spherical mirrors (save any minor touch ups). Edit: Found that the C9.25 doesn't have a spherical secondary, any others? In any case, I don't want to derail this thread. I'm pretty sure the old 80's SCT I tested has spherical mirrors. Edited by Boom, 21 March 2019 - 01:41 AM. SCT and MCT are different in many ways, especially from a Gregory MCT with the secondary radius the same as the back of the meniscus. The SCT has a separate secondary allowing some freedom to deal with aberration. The SCT corrector plate has a unique curve very similar to the balanced high/low wavefront of the MCT. Your posted graphic indicates spherical undercorrection, if you are certain that extra is on the left, intra on the right. How was this focused - via drawtube adjust or mirror movement? The reason I ask is that some Maks have a lever/fulcrum focus adjust arrangement, so mirror movement is opposite to SCTS in terms of the primary focus knob. Some scopes, for example the ETX90/105/125 series and similarly constructed Maksutovs, use a lever and a fulcrum in the focusing mechanism with the center of the primary as a load. Its a superior way to perform focus, in my view The resulting mirror movement rule above becomes reversed. I'm positive left is extra, right is intra. I pulled the eyepiece out 8mm for the extra, refocused on the artificial star, then put it back in 8mm for the intra. The ETX Maks do not have a fulcrum lever focuser. 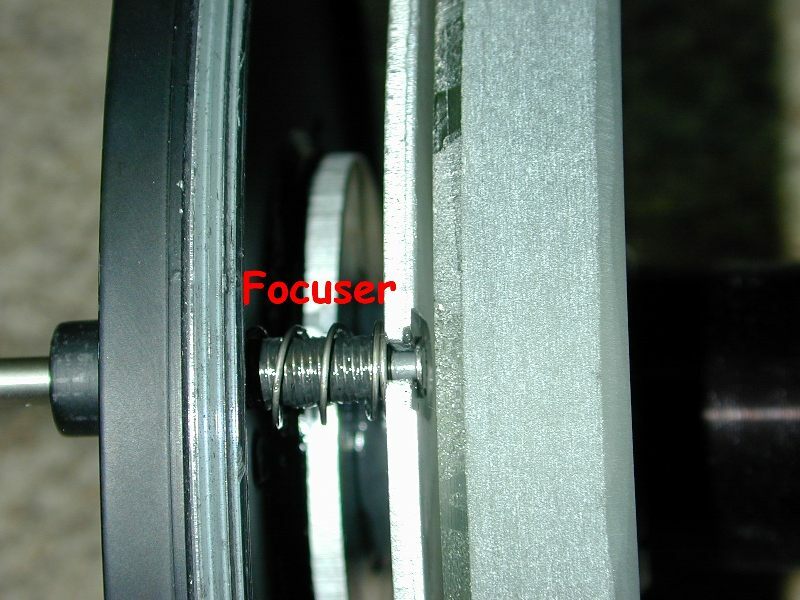 The focusing shaft is basically just a screw on the back-plate and turning it CCW pulls it out from the back plate along with the mirror, thereby increasing the distance between the primary and menicus/secondary when you focus close. Here's a photo of the ETX focuser shaft. Ignore the spring, that is not part of the original design. Edited by Boom, 21 March 2019 - 12:34 PM. On most if not all SCT's rotating the primary focus knob CCW goes to infinity or star focus. "Rotate the focus knob clockwise to focus on distant objects and counterclockwise to focus on nearby objects." This would indicate a fulcrum arrangement. Your photo is different from the original I've saw several years ago, once posted here in this forum. Strange. Anyway, back to the original obs it appears the meniscus power may induce under-correction at close focus. I did not expect that, but have not really investigated it thoroughly. Basically I find artificial stars only good for rough collimation of scopes in the horizontal configuration. For refractors one can do more in the way of an optical test. The long distances needed for larger scopes entails ground seeing effects which can be as bad as regular sky seeing. You are correct that the ETX Mak focusing convention is opposite an SCT. Simply put this is because the SCT knob is FIXED to the back plate and its thread moves the mirror cell, while the ETX is FIXED to the mirror cell, and its threads moves it against the backplate. In other words, the SCT knob doesn't move in and out when you focus, while the ETX knob does. I have never seen an ETX with a fulcrum setup. I have taken a few ETXs apart and they all have the focuser like one in the link. Reverting back to the topic, you're right the artificial star at close distance is of limited use. I was really just trying to verify what I read about SCT close focusing. When I discovered my MCT exhibited the opposite effect, it got me thinking. Edited by Boom, 21 March 2019 - 01:41 PM. Interesting, I have seen the fulcrum in the ETX, so somewhere along the line the design must have changed. Curious about the Mak's. There are different configs and surface treatments but which is which in terms of induced spherical not stated. From your one data point (!) it could be Gregory - under : Rumak : over ? That is curious about the MCT being either. I can recheck my Gregory MCT, but I recall is was over corrected at near focus (less than 90 feet). I am wondering if, as you stated above, if the power of the meniscus and the distance (~40 feet) to the artificial star made the difference. What if the artificial star was located at or very near the meniscus back focal point? Would that be the same as rays diverging to the spherical primary from a nearby distance letting us see the under correction of the primary alone? Edited by Asbytec, 22 March 2019 - 06:44 AM. Should have mentioned evaluating this sort of behavior for a scope with moving mirrors is complicated. You can adjust the spacing or extend the focus out with tubes. The 2 methods will likely have different impacts. Hi Glenn, yes, of course. It is complicated, anyway, then with a moving mirror, too. Interesting to think about, though. OSLO shows overcorrection for SCT and undercorrection for both, Gregory and Rumak MCT. The difference is that in the first case dominates the relative increase in overcorrection on the corrector and secondary vs. undercorrection on the primary, while for the latter it is the opposite. I've never tested my Rumak with an artificial star, had no need to. Only short refractors. Now you and Boom have my curiosity up and I also wonder where Suiter got his data from. Might try just to validate your analysis. Not that I doubt you.